As of 2018, these contest results are very old! For recent results, see the ARRL's Results Database. W1XM participates in almost every January VHF, June VHF, and September VHF contest. The MIT UHF Repeater Association regularly participates in ARRL sponsored VHF contests. We operate from a weak signal station on the top of MIT's Green Building (54). Our grid is FN42ki. 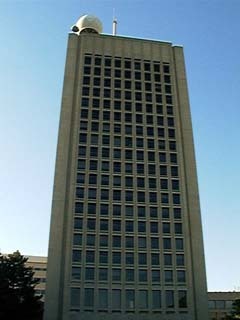 MIT's Building 54 is 295 feet tall, the tallest building in Cambridge. We have line of sight to most of Greater Boston and Cape Cod. You can see all of Boston Harbor, and well into Waltham on a good day. At night, the major highways are quite visible. The station resides in room 54-2101, an old lab shack on the top of the building. This unique setup allows quick and easy access to all of the antennas. As such, the entire antenna setup is always in flux and can be changed with little effort even during a contest! September 6m, 2m, 1.25m, 70cm, 33cm, 23cm, 3cm Unlimited Multiop 83,578 10th in W/VE! 2003 January 6m, 2m, 1.25m, 70cm Limited Multiop 24,684 10th in W/VE! Unfortunately, we don't have a card designed or printed yet. If you need a QSL from us immediately, please QSL via our callbook address. Provide a SASE and a note indicating that you need a QSL card urgently. We will provide you with something suitable in the interim. We will send QSL cards once cards are produced. Please continue to send us cards. Our operators appreciate it a lot! MIT students, staff, and faculty are welcome join the club. Contact the officers at w1xm-officers@mit.edu.